When I fly back to the United States, I often take gifts for my family and friends. In my search for unique gifts made in Cambodia I have visited many stores in Phnom Penh, and one of my all-time favorite places to shop is Tabitha Cambodia, a non-profit organization started in 1994 by Canadian citizen Janne Ritskes. Not only do I find special, wonderfully-made handicrafts at Tabitha, but I know that my purchases help to support local families and communities. 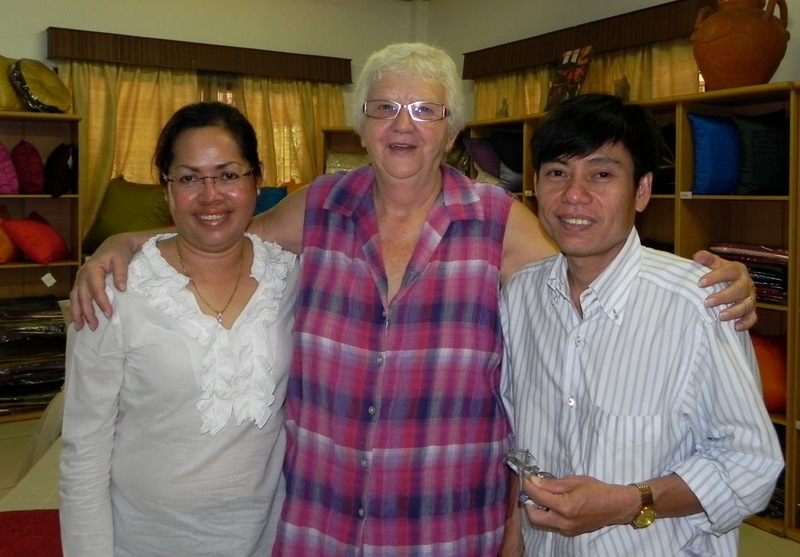 Janne Ritskes (centre) is the founder and director of Tabitha Cambodia. I have long admired Tabitha Cambodia’s cottage industry program, which provides training, employment, and income for poor Cambodians to manufacture the silk handicrafts and other products Tabitha is famous for. I also learned about the range of community development programs the organization uses to help the poorest people in Cambodia become self-sufficient and independent. For example, one of Tabitha’s main programs focuses on personal and financial development. The Family Partnerships and Savings Program helps families with no savings to set financial goals to make their lives better. Through sustained support by Tabitha staff and interest earned on their savings, families obtain a sustainable source of income and are able to achieve their goals, including providing for their own food, clean water, and shelter. 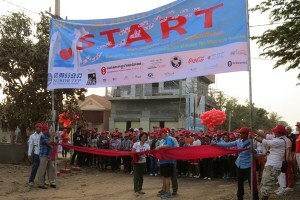 Since its foundation, this program has made a positive impact on over half a million families in Cambodia! 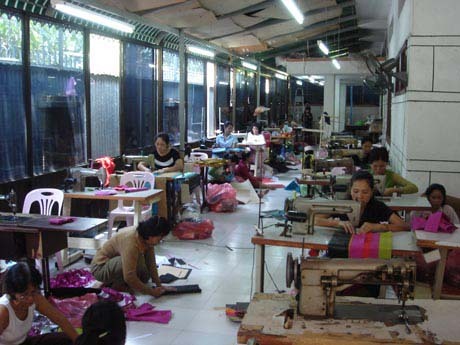 Tabitha Cambodia’s cottage industry programme provides training, employment, and income for poor Cambodians. Janne has tremendous energy and drive. In addition to her responsibilities at Tabitha Cambodia, Janne has embarked on an ambitious endeavor to build the Nokor Tep Women’s Hospital, which will treat impoverished women in need of gynecological medical care in Cambodia when completed. Having lived in Cambodia for the past two decades, Janne realized how few quality medical services were available to women in the country. Last weekend, the Nokor Tep group held their fourth annual walkathon, which brought together more than 750 participants and raised more than $75,000 for the hospital. For over 20 years, Janne has worked tirelessly to empower the poorest families in Cambodia to lift themselves out of poverty. Janne’s story is truly inspiring, and is a testament to the power of one individual to create a positive impact and bring about long-lasting change. I want to personally thank Janne for her long-term commitment to the Cambodian people. Janne, you are truly an inspiration to us all!